We celebrate 25 years of the Environmental Change Institute, an ‘ecosystem’ of over 90 researchers and 70 graduate students. 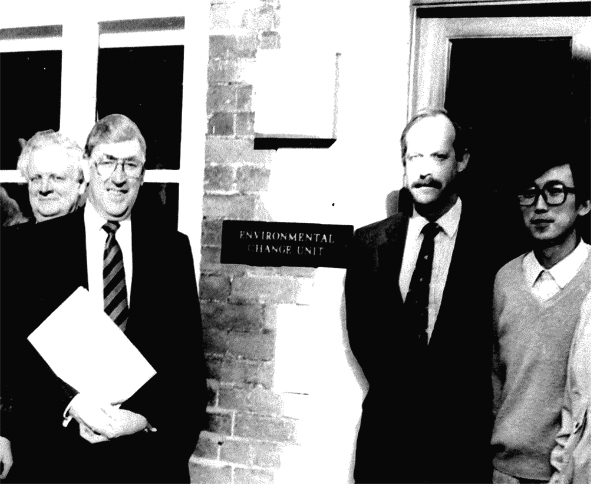 On 1 October 1991 the Environmental Change Institute (then Environmental Change Unit) opened its doors at the University of Oxford for the very first time. Over the ensuing years the ECI has flourished, becoming a pioneering force at the frontier of interdisciplinary environmental research, education and outreach. Watch the ECI-system come to life in our animation above, download the poster, and find out more about the ECI's history below. Read the ECI’s strategy 'Changing the future', outlining the scale of the environmental challenge we face and the ECI’s response. Follow us on twitter @ecioxford and facebook , to be the first to hear about the ECI's news and events. On 14 February 1991, the Environmental Change Unit (ECU) was launched with generous support from IBM UK Trust, Cohen Foundation, Dulverton Trust, Environment Now, Merton College and hundreds of Oxford alumni. ECU’s first research report is published: Climate change and vulnerable places: global food security and country studies in Zimbabwe, Kenya, Senegal and Chile, and generates The Times headline: Climate shift puts 360m more at famine risk. The UK’s first Fellow in Energy Efficiency, Dr Brenda Boardman, publishes ECU’s first energy report: DECADE: 2MtC – a guide to saving 2 million tonnes of carbon in the UK. ECU host Climate Change and World Food Security, a NATO conference that identified the agricultural vulnerability of local populations to climate change. New MSc in Environmental Change and Management begins, led by Dr John Boardman, and rapidly becomes Oxford’s most popular graduate science course. ECU hosts “Transport and the environment: the great debate”, led by UK Secretary of State for Transport, with 500 delegates from organisations across the UK. ECU is awarded £1million from the EC to continue leadership of Europe’s largest network on climate change and agriculture. The UK Government appoints ECU to host the UK Climate Impacts Programme – the first of its kind in the world - and it publishes their first report on regional climate change impact and response studies in East Anglia and North-West England. ECU changes name to Environmental Change Institute (ECI) in recognition of its role in promoting Oxford’s environmental work. The Trapnell family fund the Trapnell Fellowship in African Terrestrial Ecology, ECI’s first permanently endowed post, as a flagship for Oxford’s considerable activities in researching the African environment. The first edition of the ECI-edited Environmental Science and Policy journal is published by Elsevier in May 2001. ECI becomes founding partner in the UK Energy Research Centre and becomes conference programme host through the Meeting Place, which in its first year hosts a G8 energy conference of 200 international delegates. Under the new Directorship of Professor Diana Liverman, ECI becomes part of the Tyndall Centre for Climate Change Research and coordinates a work programme on international action on climate change post 2012. ECI launches the 40% House report - how to reduce emissions in the UK housing sector by 60% - at the Royal Society in London, receiving widespread media coverage. ECI benefits from Oxford’s largest benefaction from Dr James Martin, to set up the Oxford Martin School. This funding enables a series of research fellowships on climate governance. ECI is selected to host the Global Environmental Change and Food Systems programme. ECI takes over the coordination of the network for advancing science in Amazonia with the appointment of ECI’s Statutory Professor, Yadvinder Malhi. ECI hosts an international conference on climate change and the fate of the Amazon, leading to major paper in the journal Science and a thematic issue of the Philosophical Transactions of the Royal Society. Dr Brenda Boardman makes witness statement in Judicial Review against the UK Government for failing to meet its legal requirements to eradicate fuel poverty under the Warm Homes and Energy Conservation Act 2003. ECI ideas are selected for the Sustainable Development Commission’s event: Breakthroughs for the 21st Century and presented to Prince Charles. ECI hosts a side event at the 2009 UNFCCC COP conference in Copenhagen on the implications of 4°C of climate change. ECI hosts the "4 Degrees and Beyond" international conference, leading to papers in Nature and the Philosophical Transactions of the Royal Society. Professor Jim Hall takes over as Director of ECI. He brings with him the £4.7million Infrastructure Transitions Research Consortium. ECI coordinate Oxford University’s presence at London’s Planet under Pressure conference - the world’s largest gathering of experts to provide scientific leadership for the UN Summit, Rio +20 later in the year. ECI benefits from Oxford University’s successful application to join the NERC Doctoral Training Programme, one of 15 Universities to be awarded funds amounting to £10 million. The citizen science climateprediction.net project is awarded runner up in the ‘Outstanding research impact’ category of the Guardian University Awards Ideas Bank. Scientists from ECI contribute as lead authors in the 5th Intergovernmental Panel of Climate Change Assessment reports in all three working groups. ECI launches a new Sustainability Internship Programme offering Oxford students summer business placements in companies including: GlaxoSmithKline, Nestle, Unilever and Coca Cola. A new report by ECI and the Global Water Partnership shows floods, droughts and a lack of investment in providing good quality, reliable water supplies is dragging down the global economy. First published in the Oxford Magazine, October 2008. Twenty one years ago, in 1987, when Sir Patrick Neill was Vice-Chancellor, the University of Oxford decided to launch an innovative and ambitious fund-raising venture called Campaign for Oxford. Departments were invited to submit bids to Council for objectives they would like to see included in the Campaign’s portfolio. The School of Geography sent in a proposal for the establishment of a new unit to study Environmental Change and, at the suggestion of Sir Richard Southwood, the Departments of Zoology and Plant Sciences (which included Forestry) were subsequently invited to participate in this proposal. Council duly agreed that the Environmental Change Unit (ECU) would be one of the key fund-raising priorities of Campaign for Oxford. Professor Goudie, then Head of Geography, was appointed leader of the task force to take this forward, and some Development Office staff, notably Ian Curtis and Jitka Fort, were charged with helping with the fund-raising efforts. There were two reasons why Geography put forward the vision of the ECU. The first was an internal one. Geography was a rather traditional department with an emphasis on undergraduate teaching, relatively modest research grant income, and a need to strengthen its research culture. On the other hand, it had a number of very active individuals in both physical and human geography for whom studies at the interface between people and the environment were a long-standing focus. The second reason was an external one. As the 1980s progressed it became more and more apparent to researchers in Geography that global environmental change was going to become a great issue of trans-disciplinary concern. It was an issue that required new money and new people if Oxford was to be a major player in this nascent field. Thus fund-raising was pursued with vigour and in due course sufficient money was raised to make the ECU a reality. In particular, IBM UK provided funds for a Directorship at professorial level for five years, Merton College provided a small, refurbished building in Mansfield Road, and over a thousand graduates contributed essential "unrestricted funds". The ECU was launched on February 14th 1991 in the School of Geography, with speeches from Professor Goudie, Sir Anthony Cleaver (Chairman and Chief Executive of IBM UK), Sir Crispin Tickell (Warden of Green College and President of the Royal Geographical Society) and Professor Sir Richard Southwod (Vice-Chancellor). As stated in the University’s Statutes, Decrees and Regulations, "The functions of the unit shall be to organize and promote interdisciplinary research on the nature, causes and impact of environmental change and to contribute to the development of management strategies for coping with future environmental change". Professor Martin Parry was appointed as the first Director and started in October 1991 with 12 staff and a budget of £1.1 million. By October of the following year he had 22 staff and had made the first intake of graduate students. He became a Fellow of Linacre, a college which under Sir Bryan Cartledge had seen the importance of environmental concerns (including establishing the pioneering and now long-running Linacre Lecture series). Another crucial development was the success of St Hilda’s in obtaining money from Powergen to support a fellowship in Energy Efficiency. This was to be associated with the ECU. Dr Brenda Boardman of the University of Sussex was appointed in 1991 and brought with her Dr John Boardman, who was an ideal person to help run a proposed new taught masters course but also to undertake research on soil erosion and land degradation. Other major early funders included Nuclear Electric plc and the MOA Foundation. The ECU benefitted greatly from the establishment of a highly distinguished Advisory Council, chaired initially by Professor Southwood, and having among its members Sir Tony Cleaver, Sir Crispin Tickell, Sir Victor Blank, John Gummer, and the late Lord Holme of Cheltenham. (It is now chaired by Professor Tim O’Riordan, one of the founding fathers of UK environmental science). The initial research programmes were in Climate Impacts and Responses (led by Dr Tom Downing), Energy and the Environment (led by Dr B. Boardman) and Long-term Environmental Change (led by Dr Alayne Perrott). By 1994-5 there were also programmes in Land Degradation and Rehabilitation, Mountain Regions, and Environmental Laws and Institutions. Very importantly, the taught MSc course in Environmental Change and Management was started in October 1994 with 15 students, and was led in its early years by Professor Michael Williams (Course Director), and Dr J Boardman (Course Co-ordinator). Dr Boardman succeeded Professor Williams as Course Director, a post he held until 2008. The course’s purpose was "to equip promising students from all over the world, and from different backgrounds, with the technical and other skills needed to put essential environmental policies into action." Over 120 students from 30 countries applied for the first year. Now there are regularly around over 200 applicants for just over 30 places. In all some 400 students from over 60 countries have successfully graduated and many hold high positions in government, NGOs and business. The early years of the ECU were not easy. The first two directors, Professor Parry (October 1991-March 1994) and Professor Richard Macrory (November 1994-1996) did not stay in post for as long as was hoped. There was also some competition for funds from other environmental centres that were subsequently established in Oxford itself (for example, at Mansfield College), and the environment had still not become the big issue that it is today (despite the immense publicity surrounding the 1992 Rio Earth Summit) . Fund-raising was a challenge, not least in North America. Nonetheless, under the directorships of Professor Jim Briden (1997-2003), Professor Diana Liverman (2003-2009), Acting Director Professor David Banister (2009-2010) and, most recently, Professor Jim Hall (2010 to present), the ECU (now ECI) has prospered. On November 23rd 1999 it became the Environmental Change Institute (ECI) and in October 2005 it moved in to new, larger premises in the Oxford University Centre for the Environment in the old Dyson Perrins chemistry department. The vision of the early days has been vindicated: the ECI has over 60 research staff; large numbers of doctoral students (36 in 2007); its budget in 2006-7 exceeded £2.8 million; it has a number of very successful new research programmes to add to those in climate and energy including biodiversity and ecosystem dynamics (including the Trapnell Fellowship in African Terrestrial Ecology and Jackson Fellowship in Biodiversity and Conservation); it is home to UKCIP (the United Kingdom Climate Impacts Programme); it is a founding member of the Oxford Martin School; it is one of the core partners of the Tyndall Centre for Climate Change Research (the UK’s principal consortium mobilizing climate change science and policy research) and of the UK Energy Research Centre (UKERC), and has one of the most successful and influential Master’s courses in the world. The ECI’s founding benefactors will perhaps be inspired by the Institute’s breadth and depth of research and education achievements - as were the founding staff with the former’s generosity and vision.